Usually, I would put these up a few hours before the game, mostly because, on my time zone, games like these are finished after midnight on a working night, making it hard for me to do a write-up until next day. With a match thread at least you all at least have somewhere to comment. In this case it goes up early because we have a match squad which seems bizarre to me. Only 2 central defenders and only 2 recognised forwards. The former situation is forced on the club. Gabriel is injured and Roncaglia has a 4-game suspension, which means Garay-Diakhaby are the only central defensive pairing available. However, this does make the decision to send both Murillo and Vezo out on loan questionable. I know the players themselves were probably pushing for it, to get more game time, but that meant that we needed to get in a player who was available for Europe. Bad planning. Mina and Gaya also had injuries. The latter's doesn't seem that serious, but the biggest absence is Rodrigo, who the coach has just decided to leave out. I totally don't understand that one at all, with Mina out and Rodrigo hitting form recently. I thought the whole point in resting Rodrigo against Sociedad was so he would be fresh for Europe? 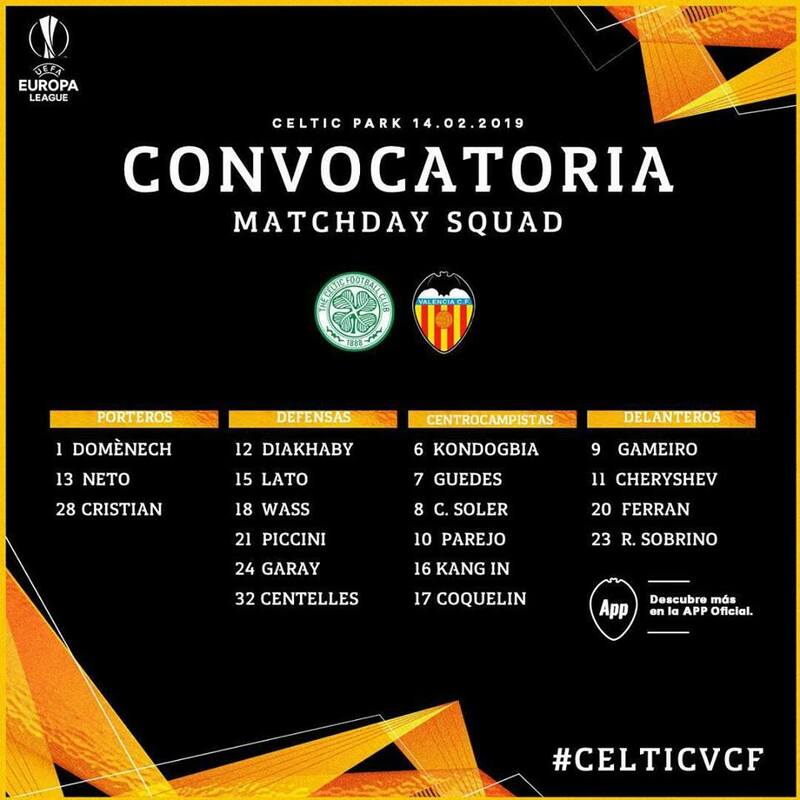 If he was going to be rested for Glasgow, why not just play him the full league game vs Sociedad and then give him the week off? So up front we have Gameiro, who has only recently started to get in form. With him we either have Sobrino, making his debut in a key European game, which doesn't seem wise to me. Otherwise, we have Guedes or Cheryshev as the second striker. Sure, the two have played there before, but the last time was the 2018 world cup last summer with different teams. A crunch European game is not the time to experiment. 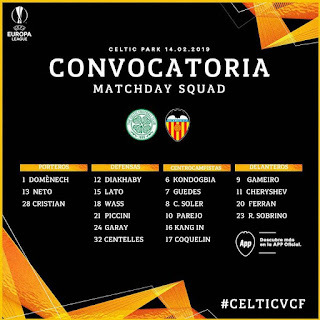 The only conclusion I can come to from this is that Marcelino has made a strategic decision to go easy in the Europa league and prioritise the league and Copa del Rey. If so, that's very disappointing. I really thought injury-hit Celtic were there for the taking and these decisions make it harder that we can progress. Not only does progress give us instant cash, it gives us European ranking points which mean better seeding, easier draws and a bigger share of cash next time we reach Champions league.